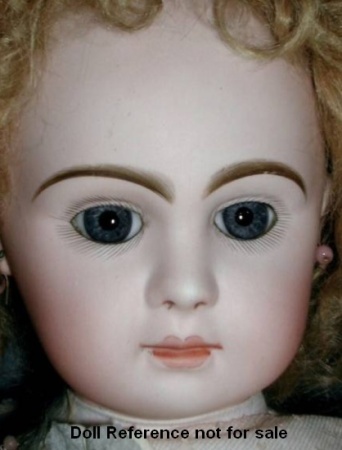 Early Danel & Cie, Paris Bébé doll, 27" tall, bisque socket head doll, paperweight eyes, lightly painted upper & lower lashes, feathered brows, lightly outlined lips, pierced ears, composition jointed body. The Danel & Cie Company was founded by Messieurs Anatole Danel and Jean Marie Guepratte located in Paris and Montreuil-sous Bois, France. Danel was a past director of the Jumeau doll company, which had a factory across the street from one another. In 1890 Jumeau successfully sued Danel & Cie for copyright infringement. 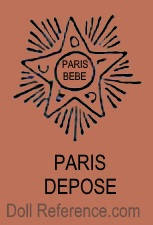 By 1896 Jumeau appears to have taken over producing Danel et Cie bébés, probably as part of the settlement, they renewed the Paris Bébé and Bébé Français trademarks and continued with their own production of the dolls, through to joining SFBJ after 1899. Danel & Cie are best know for their bisque socket head dolls, with paperweight eyes, feathered brows, pierced ears with wood and composition jointed bodies: Paris Bébé, 1891 Bébé Français and 1892 black Bébé Français of which they are the earliest reference to producing bebes of this type in France, all of which are high quality. Guépratte registered the trade name Bébé Soleil. 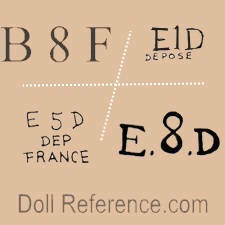 Danel & Cie identifying doll marks; 1889 symbol of an Eiffel Tower; Tété Déposée Paris Bébé, B # F, BGF, E 1 D, E.8.D, E 5 D Dep France, doll shoe mark a star symbol initials DLGRC Paris, DEPOSE. Note: The French term Bébé = dolly or baby faced doll.